Megan Taliaferro is as comfortable treating a mini horse as she is to a goat, and she looks forward to adopting a new lab puppy this summer as a companion for her tabby, Owen. But in addition to her love for animals, Taliaferro has an affinity for teaching – the main reason why she chose to leave a Suffolk animal practice to be the first head of Tidewater Community College’s new veterinary assistant program. TCC’s inaugural class of 18 working toward a Career Studies Certificate in Veterinary Assistant began the program this spring and will graduate in December 2016. The 17-credit program prepares students to assist and support licensed veterinary technicians and veterinarians in the health and handling of small domestic animals and exotic species. The certificate program introduces students to an expanding career field that includes work in zoos, aquariums and laboratories in addition to traditional work in a local veterinary clinic. “Just about every kind of health care we do for humans, we can now do for animals,” Taliaferro said. Blue Ridge Community College’s distance education program for veterinary technologists is an option for those wishing to continue their education in the field. While a career studies certificate is not a prerequisite for acceptance into that program, it is helpful training and valuable experience for those considering the option. Acceptance in that program, offered at TCC only once every three years, allows students to take classes twice weekly at the Virginia Beach Campus. Three times during the semester they travel to the Blue Ridge campus in Weyers Cave, Va., for labs and practicums; the next cohort at TCC begins in June 2018. Taliaferro reached the height of the profession deciding “I wanted to be a vet when I was 8 years old,” she said. As a 16-year-old, she walked dogs and cleaned cages for a vet in Woodbridge, staying after hours to be mentored by him. 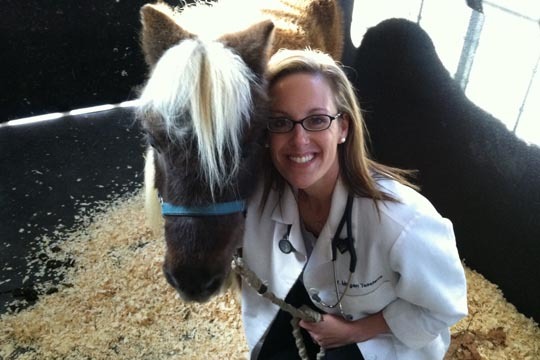 After graduating with a bachelor’s in science at the College of William and Mary, she attended the Virginia Maryland Regional College of Veterinary Medicine, graduating in 2002. Her early experience came in emergency vet hospital followed by three years at Banfield Animal Hospital in Chesterfield. Taliaferro encourages potential students in the TCC program to understand that while love of animals is essential in veterinary assisting, so are communication skills. “There’s always a person holding the end of a leash,” she said. The program requires two unpaid internships: one in the first semester of the program for 80 hours and a second one the following semester of 160 hours. Field trips and guest speakers are part of the curriculum, which is overseen by an advisory committee of veterinarians, veterinary specialists, licensed veterinary technicians and an industry representative. Potential students interested in the program can email Taliaferro at mtaliaferro@tcc.edu or call 757-822-7264.